DICE (Dynamic Intelligent Currency Encryption) is an exceptional hi-tech achievement, which solves thousands-of-years old problems and guarantees unforgeable banknotes, securities as well as other important documents. Since time immemorial, cash determines the social and economic life of our society and just as long, humanity suffers under the cash related risks and problems that arise until today and foster the crime. In addition to the persistent counterfeiting, which affects virtually every country and monetary system, holdups and bank robberies are a present problem that could not be solved until now and needs to be addressed. The DICE procedure was developed to consequently solve all security-related complications of cash systems today, and to fight global criminality while protecting the citizens. According to the current development, the DICE banknote is also the answer to all problems that are being traded as a motivation for governments to abolish cash. Due to the numerous benefits, the “banknote of the future” is destined to find strong support from both, the governments and the citizens. Based on identifiable banknotes, preferably with a custom-frequency and secure RFID or machine readable codes like Datamatrix – or a smart combination of both, the DICE system integrates reliable and innovative technologies that combine their advantages to incorporate them into an optimized security. Digital Automated Systems, which are based on a number of highly intelligent systems that register and manage the banknotes. DASU (DICE Automated Security Unit), the central security unit that monitors and manages the proper functionality of the systems. 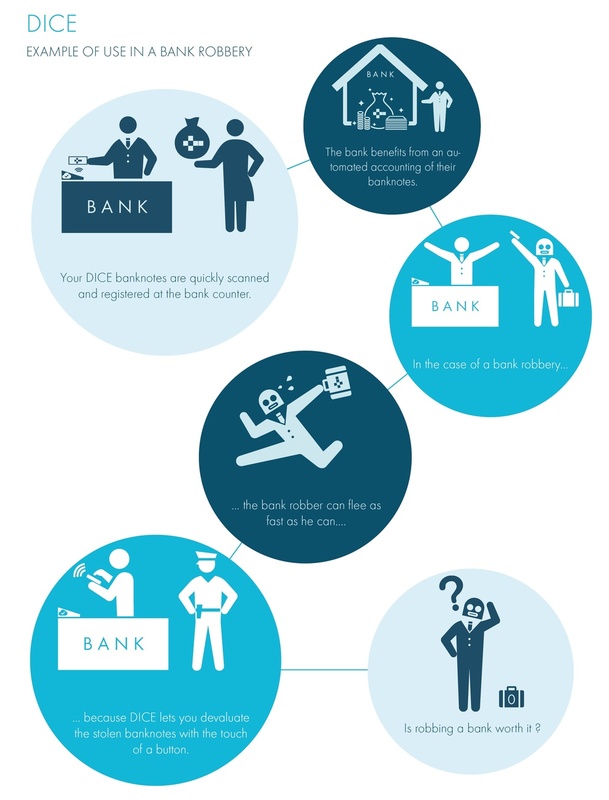 The concept relies on the registration of banknotes through connected retailers, banks as well as everyone that has to fear offences due to the possession of a large sum of cash. The lightning-fast registration of the banknote through the blockchain-enabled DICE-cloud device does not influence the day-to-day business negatively, but furthermore gives full protection of the registered cash assets for any DICE-user. During the registration-procedure, the DICE-user will be informed about the legitimacy of the incoming banknote and warned, whether the banknote is part of a crime, is forged or has been degraded for a certain reason. Once the banknote has been successfully assigned to the user’s account, any actions to take money against the will of the owner will be futile, since a DICE-connected victim can always request an executive remote devaluation of the notes. The application examples of DICE are numerous and range from the simple anti-counterfeiting of banknotes to the fight against terrorism. Furthermore, the security to have your cash assets registered to a centralized and safe system, protects you from losing it through other catastrophes, such as a fire or a flood. EDAQS categorized the DICE as a semi-governmental project for the public benefit, and is currently subject to negotiations for a global implementation of the system. More information about the DICE shall be available on the official website soon. was created by EDAQS on 2014-07-25. Description: Die Anwendung von DICE-Banknoten verhindert Falschgeld und löst bargeldbezogene Problematiken mit Schwerpunkt Kriminalität (z.B. Bank- und Raubüberfälle). Die Erfindung beruht auf dem Einsatz einer Banknote, welche mittels eindeutiger Identifikation an ein digitales Registrierungssystem angeschlossen und passiv kontrolliert wird.